We are continuing to decorate our Sherlock Holmes-themed tree to celebrate Christmas in July. Each Thursday this month we will show you how to make an ornament for your tree. Last week we made Mind Palace Ornaments using clay and an embossed rolling pin. Today’s ornament is a Sherlock Holmes Silhouette Cube. This one is pretty easy, even if you’re not a great painter. Step One: Cutout your Sherlock Silhouette as closely as you can. Instead of cutting out the center to make a stencil, which would work too, I cut out around the edges. Tape your cutout to your glass ornament. Step Two: Using the taped on Sherlock and an extremely fine paint brush, paint the outline of the silhouette as if you would trace a shape with a pencil. Once you have an outline, you can carefully remove your taped cutout. Step Three: Paint inside your outline. You can use a larger brush, but be careful when you get to the edges. You may have to do a few coats of paint for it to fill in and cover all the glass. Step Four: Cut your book pages into strips. The ornaments are even better if you use the pages of a Sherlock Holmes book (if you’re willing to tear one up). Using one of your scissor blades, curl the strips like you would ribbon on a gift. Remove the top of the ornament and feed your pages through the opening. Step Five: Cut your ribbon and tie it on so that you can hang the ornament on your tree. 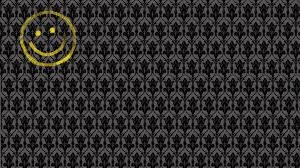 I used the ribbon shown because it reminded me of Sherlock’s wallpaper on the BBC show Sherlock with Benedict Cumberbatch. Next week we’ll make Illustration Cutout Ornaments. I love these! Very unique.